Kit 64 sq.ft. 2.5-inch X 6.5-inch X 96-inch Ceiling Tiles in White (16-Pack) is rated 4.8 out of 5 by 12. Rated 5 out of 5 by Redbird from Easy to install I bought this a month ago after my contractor pulled out of my basement renovation before finishing it. This ceiling was straight forward to install. We had to be creative with some of the clips to make it fit the space by cutting them in half to provide enough pieces, but there was plenty of tile and edging to complete the job. It is a Canadian made product and looks great. It has added several inches to the height of the basement without being a fixed ceiling which was the prime reason for buying it. Yes, it’s a bit expensive, but worth it to me. Rated 5 out of 5 by Sully from Great Product I bout this for my daughters basement that has bulkheads. I did not want to lower any of the other areas any more than needed. This product allowed me to do that. Rated 4 out of 5 by otis27 from Good product. The you tube instructions were very helpful and the ceiling turned out just as was shown on the promotional video. It was easy to install but took more time than expected. I am very pleased with the finished product. Rated 4 out of 5 by Contractor from Decent product Pros: Decent product to install yourself. Looks good, much better than the old commercial 4x8. 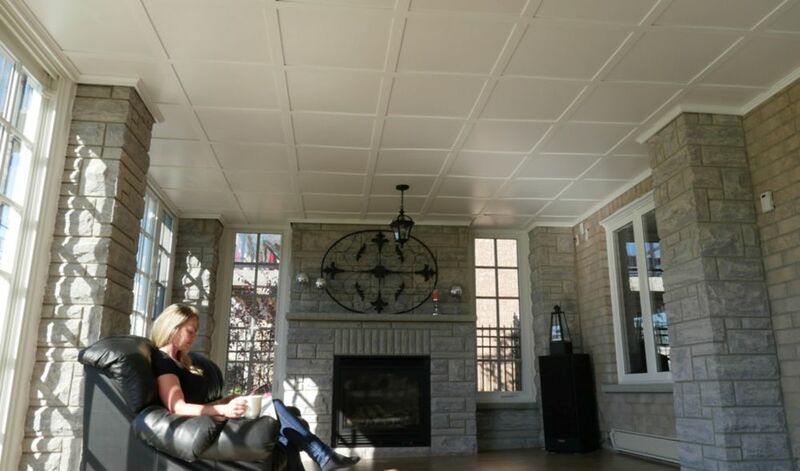 More of a coffered ceiling look. Total thickness is 1 1/4". Cons: -A bit pricey and wasteful since you can only buy it in kits of 64sq/ft. The individual piece packages are expensive if you bought the pieces individually the equivalent of what's in the kit would cost you double. So plan out what you need, buy extra since you can return it. -The slide clips are defective, the 4 kits I got in March would not go on unless you hammered them on. -Only meant to go on ceiling wall to wall. If you are trying to do a bulkhead or have any other outside corners you have to get creative. Tips-- If you are short on panels don't order the extra ones, HD sells hardboard 1/8" thick white which is identical to the panels. Snapclip kit 16pannels=$100 If you buy the 4x8 sheet and get HD to pree cut them for you at the 22.25"width x8' than all you do is cut your finished size for fillers on the wall= no waste. You get 8-2x2 panels out of a 4x8 sheet for $19. Rated 4 out of 5 by PeterV from Great looking product ! Looks great once complete and installed. Install is relatively easy. Had issue with supplied measuring tool. When using it, it always left a visible space between the Snapclip bar and the Snapclip Tbars and J-Mould. Ended up manually creating a measure device and using it to get a tighter fit. Rated 5 out of 5 by do it yourselfer from looks great did the entire basement. easy to install looks a lot better then traditional drop ceiling. Had to get extra t bars and panels.even shipped back a box of extra panels at no cost. Rated 5 out of 5 by handyman from High-end look Bought this and installed myself for a second time. Awesome product. Rated 5 out of 5 by Bdub from Easy install! Looks great, easy to install! Completed project in a day and transformed basement. Easily added a few low profile pot lights into panels. I'm looking for a way to soundproof existing basement ceiling in order to create a secondary apartment. &nbsp; &nbsp;Some of the basement is ceiling panels and some drywall. &nbsp; &nbsp;Does drywall need to be removed? &nbsp; Is snapclip system a way to reduce noise? My room is 6 1\2 my 8 1\2 would I be able to use this kit?